Oil spills into bodies of water are eco-crisis that devastate not only the body of water but the surrounding land areas and wildlife. Cleanup, even when responded to quickly, takes quite some time and it takes even longer for the natural balance to return. 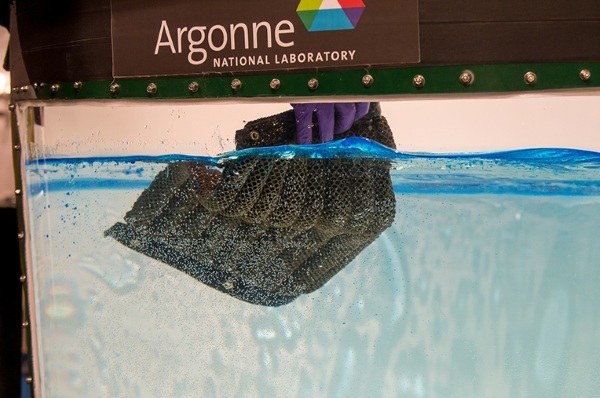 The Oleo Sponge is a new innovation that will help clean up more oil faster. This is literally a sponge and works just like a sponge. Place on spill, soak up, ring out. The key feature of this one is that it only soaks up the oil and can pull it from both the surface and below. The name may sound like a high-class beauty product, but this is made for saving the planet. The sponge is made from polyurethane foam and the surface is covered with oleophilic molecules. These little guys pull the oil out of the water. The sponge can collect up to 90 times its own weight in oil and get this, in some cases, that oil can be used. Once wrung out, it is possible to reclaim some of the oil so it’s not “lost”. The perfect solution is to end our reliance on these sorts of fuels but until then, figuring out better ways to clean up our mistakes will help. Watch the video below to see it at work.